Toronto's Scattershot Efforts to Commemorate Queen Victoria. Group at statue of Queen Victoria, Queen’s Park, ca. 1912. From the City of Toronto Archives, Fonds 1244, Item 2211. The Golden Jubilee, celebrating Victoria’s 50th year on the throne, prompted an outpouring of patriotic fervour in Toronto in 1887. So large was the crowd attending a special Jubilee church service, with representation from most of the city’s denominations, that they couldn’t all fit in the Metropolitan Church. After a series of effusive speeches by the lieutenant-governor, premier, and mayor, the proceedings closed with a song—composed especially for the occasion by F.H. Torrington—”sung with great spirit and feeling” by all assembled, according to one in attendance. Such was the loyal adoration Torontonians held for Queen and Empire. Yet, despite Victoria being the most commemorated British monarch, with statues in her honour scattered throughout the expansive British Empire, it took over 30 years of desultory efforts before Toronto erected a permanent Victoria statue of its own. 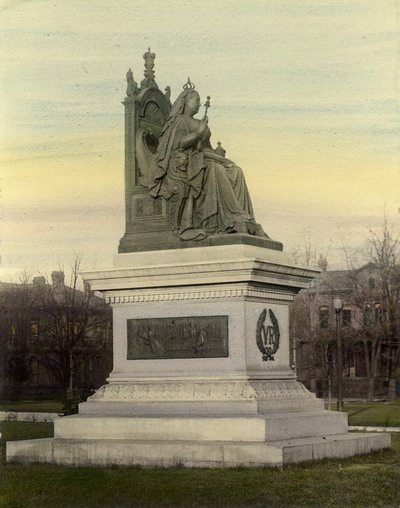 Photo of Queen Victoria monument at Queen’s Park, 1870, by Arthur R. Blackburn. From the Toronto Public Library Digital Collection. Queen’s Park was originally intended, Mark Osbaldeston writes in Toronto 2 (Dundurn, 2011), to feature a statue of Victoria—the queen of the park’s name—in a place of honour at the head of University Avenue. 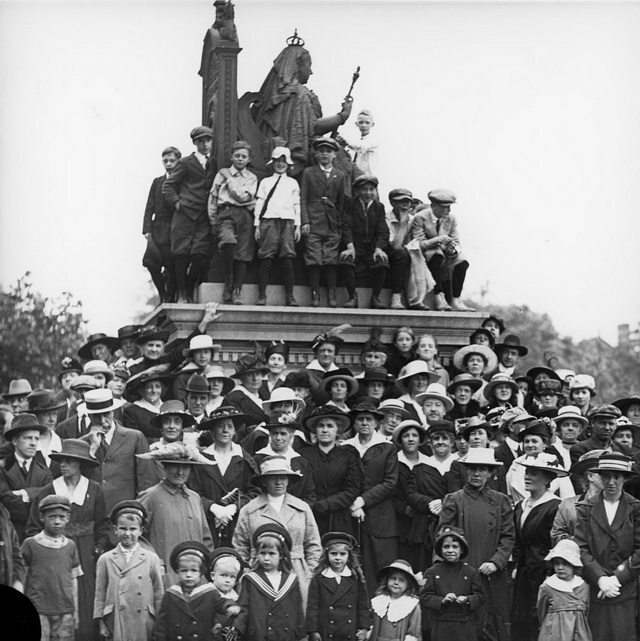 When the Prince of Wales (the future King Edward VII) officially opened the park on September 11,1860, he laid the cornerstone for the base of a statue for that very purpose. 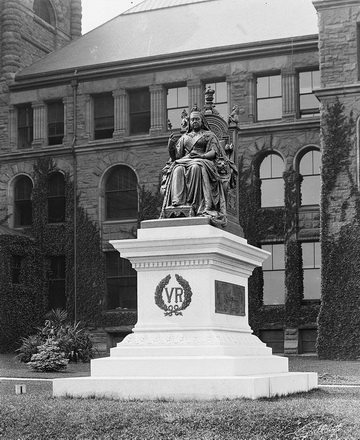 A statue of Victoria, however, wasn’t added to Queen’s Park until April 1871—and then only temporarily. At that time, city council gave permission to Marshall Wood to install his bronze depiction of a young Victoria, standing regally, on a tall wooden pedestal. It was almost an exact duplicate of the statue erected the same year in Montreal’s Victoria Square. When the proficient English sculptor—who did a brisk trade in selling his statues of the queen to communities across the Empire—travelled to Canada for the Montreal unveiling, he brought with him an assortment of other Victoria statues he hoped to sell around the country. Installing the statue in the urbane setting of Queen’s Park was part of his sales pitch. It worked. Soon Toronto’s municipal committee on walks and gardens recommended that the statue be purchased by the city for $3,000. City council debated the expenditure at great length in the fall of 1871 but never quite reached a final decision. Some aldermen balked at the cost. Others, Osbaldeston writes, went as far as questioning whether Wood’s statue even looked like the queen. At long last, in the spring of 1873, council finally formally voted against purchasing the statue—which had remained right where Wood had left it in the interim—and asked Wood to remove his sculpture in 1874. 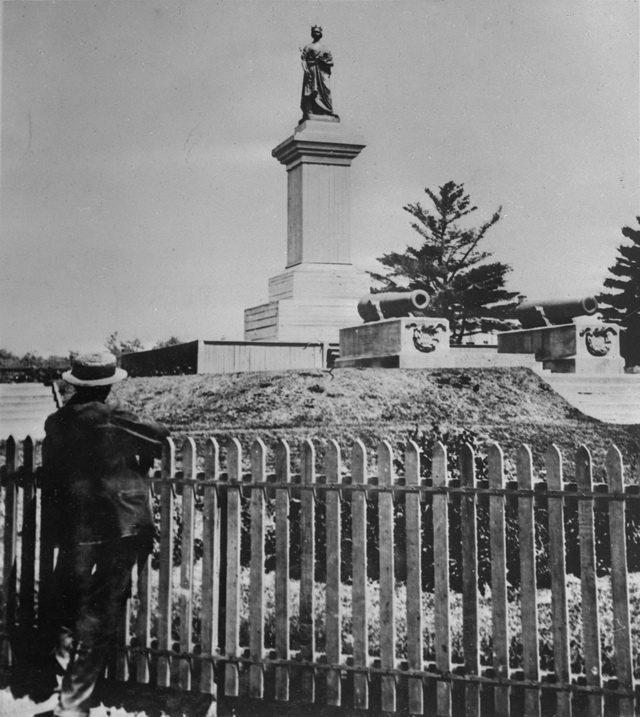 After years of neglect in storage, Osbaldeston’s research revealed, the statue Wood had placed in Toronto was eventually installed in Quebec City’s Victoria Park in June 1897. There were efforts in the mid-1880s by the St. George’s Society to commission a statue of Victoria for Queen’s Park, with a sketch of the proposed monument prepared by English sculptor Percy Wood for presentation to the membership at a June 1886 meeting. 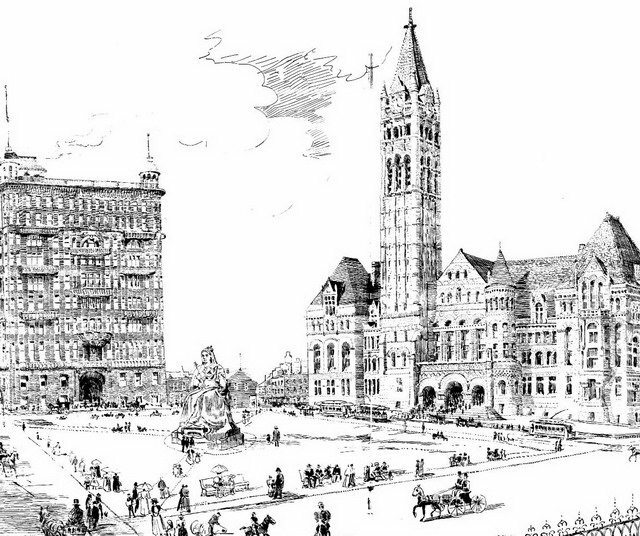 And, in the 1890s, there was a proposal to create a grand public square—named for Victoria and centered upon an immense statue—adjacent to the new City Hall then under construction at Queen and Bay streets. Neither proposal was ever completed, making the city’s most noteworthy commemorations of the queen during her lifetime the Victoria Hospital for Sick Children, which opened in 1892, and the university that relocated to the University of Toronto grounds the same year. The proposed Victoria Square at Queen and Bay streets, January 1898. From Wikimedia Commons. It was therefore a source of mild embarrassment for a city with claims to imperialist enthusiasm when, upon Victoria’s death in January 22, 1901, the only public representation of Victoria in Toronto that could be draped in black as a sign of mourning was a patriotic column in honour of the Boer War that had stood in Eaton’s department store until being installed in the main corridor of Old City Hall. The city of Toronto has grown from a little place in the wilderness to its present proportions as a great city during the time that Queen Victoria has occupied the throne, and probably no people in the Empire have been quicker to assert their loyalty and to declare the love and respect they bore to Her Majesty, yet to-day, at the end of the Queen’s long reign, there is not in this city a public statue of Her Majesty. It was unsurprising then that, within days of the queen’s death, Premier George William Ross committed to seek appropriations during the coming session of the provincial legislature for the purposes of erecting a suitable statue of the Empire’s longest-reigning monarch. Right: Queen Victoria Monument, Queen’s Park, after 1903. From the City of Toronto Archives, Fonds 1568, Item 203. One interested Torontonian, S.F. Walker, suggested to the Star that funds raised through public subscription be limited to $1 per person so that “all would feel that they had an equal share in Toronto’s loving tribute to the memory of ‘Victoria the Good,'” and even the city’s poorest might contribute to the cause. Nevertheless, the provincial government committed $10,000 to acquiring the Queen’s Park statue, including the cost of a granite base. At the municipal level, City officials convened public meetings to debate what would be best suited “to commemorate the memory and noble qualities and acts of our late Queen Victoria,” as a resolution passed at one public meeting read. While everyone could agree that something ought to be done in Victoria’s honour, the trouble became that—besides a statue—no one could agree on what tribute would be most fitting. Speaking on March 1, 1901, Mayor Oliver Aiken Howland felt strongly that while a statue—”a monument of the living image of the great departed”—for Toronto was essential, it would be “inappropriate, unusual, and unprecedented” for the city to duplicate provincial efforts and erect a second statue. Throughout the winter and into the spring of 1901, the Star published dozens of ideas and proposals for alternative tributes penned by prominent and unknown citizens alike. One Torontonian suggested a Home for Old Men; another amended the idea to be a Home for the Aged because the queen was a friend to all sexes and creeds. While one citizen proposed a home for consumptives, a doctor called for a sanitarium. There were advocates for a museum of history, an art gallery, or a reference library being built and named in her honour. The Women’s Canadian Historical Society of Toronto pressed for a Memorial Hall, perhaps constructed at the University of Toronto. Finally, several Star readers argued that the failed Victoria Square proposals of a few years earlier ought to be revived and pursued. Left: Queen Victoria monument at Queen’s Park, 1910. From the Toronto Public Library Digital Collection. Commissioned to provide Hong Kong a statue of Victoria in the wake of the Golden Jubilee, Raggi completed the work in 1890, but it would not be unveiled on the reclaimed land of Statue Square until May 28, 1896. The bronze statue depicted Victoria as an older figure, crowned and seated on a throne, holding an orb in her left hand and a sceptre in her right. Grander than what was later installed in Toronto and elsewhere in the Empire, the original monument in Hong Kong included a carved stone cupola covering the statue atop Corinthian columns. However, Victoria was among a number of Hong Kong statues looted as scrap metal by the Japanese during the Second World War. Repatriated a few years later, the statue was reinstalled in Victoria Park—without the domed enclosure. 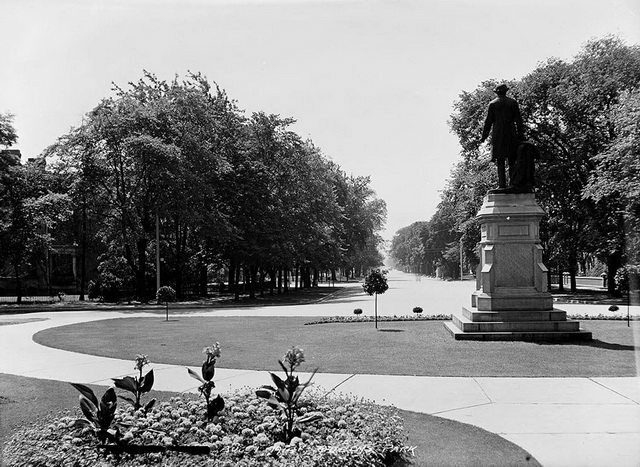 Statue of Sir John A. Macdonald at head of University Avenue, looking south from Queen’s Park, August 1, 1914. From the City of Toronto Archives, Fonds 1231, Item 1274. “Those who have seen the Hong Kong statue, of which that in the Queen’s Park will be a replica, say it is the best of Queen Victoria extant,” the Globe (July 31, 1902) proudly asserted, noting Raggi’s particular skill at capturing the queen’s features and stern expression, as well as the realistic draping of her robes. No sooner had the statue for Queen’s Park been selected, than controversy arose over the placement of the statue. In the absence of a Queen Victoria monument, the prime place of prominence at the head of University Avenue had been occupied since 1894 by Hamilton MacCarthy’s statue of Sir John A. Macdonald. The premier recommended relocating the former prime minister in deference to the crown, while opponents of this idea were adamant that Macdonald should remain right where he stood. Still others proposed compromises, like placing the queen in the centre of a new University Avenue median near College Street, or placing her in the centre of a widened King Street West near Simcoe Street. The only ones seemingly unconcerned about this debate were Mayor Howland and city officials. Exasperated by the necessity of negotiating with an unresponsive city, Attorney General Sir John Morison Gibson carried out a war of words on the newspaper page. He complained that the mayor was purposely “violat[ing] the rules of courtesy” by dragging out responding to the government’s overtures. “Oh, I do not know,” Gibson wearily responded to journalist questioning in the Star (August 20, 1901), “but unless Sir John is moved, I suppose we will have to put the Queen up nearer the building in some secondary place.” That’s exactly where she ended up—to the east of the main entrance to the Parliament building. 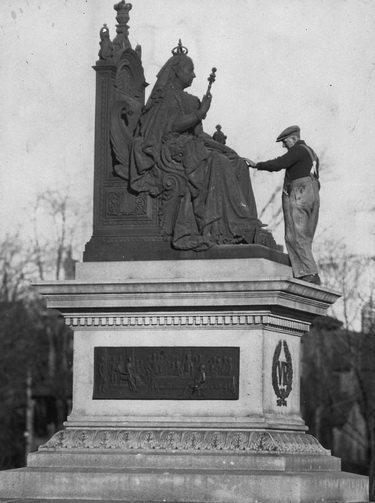 Right: Fall cleaning of Queen Victoria statue, Queen’s Park, ca. 1920. From the City of Toronto Archives, Fonds 1244, Item 3033. By the end of July, the McIntosh Company’s work on the nearly nine-foot-tall pedestal was finalized, save for the installation of two bronze bas-reliefs by J.L. Banks—depicting the queen’s first council meeting at Kensington Palace in June 1857 and the deceased queen lying in state—which would adorn the statue base. On one side of the six-ton pedestal was a bronze wreath of oak and maple leaves containing the letters V.R. “The statue was left unveiled after being put into position,” the Globe added, “and it is understood that a formal unveiling ceremony will be dispensed with.” Indeed, the Star and Globe contain no record of any official unveiling the following spring. Given that the statue of Sir John Graves Simcoe was unveiled at Queen’s Park in May 1903 by a governor general and the band of the Royal Grenadiers, and the unveiling of the Robbie Burns statue at Allan Gardens was afforded a half-page article in the Globe, it seems a strange slight to not provide a formal occasion after the decades of effort it took to finally (permanently) install a statue honouring the Queen’s Park namesake. Sources consulted: Gerald Utting, Toronto the Good: An Album of Colonial Hogtown (Bodima Books, 1978); John Warkentin, Creating Memory: A Guide to Outdoor Public Sculpture in Toronto (Becker Associates, 2010); and articles from the Toronto Globe (June 5, 1886; June 13, July 11, 22 & 31, and September 23, 1902; May 23 and June 2, 1903); and the Toronto Star (January 23, 24, 25, 28 & 29, February 1, March 2, 16, 18 & 20, June 14, July 24, and August 20, 1901; January 22, June 14, and September 23, 1902; May 27, 1903; and May 17, 2008).